Unique oceanfront multi-level home designed by Jamie Wright of Robie, architects for the Skydome in Toronto. 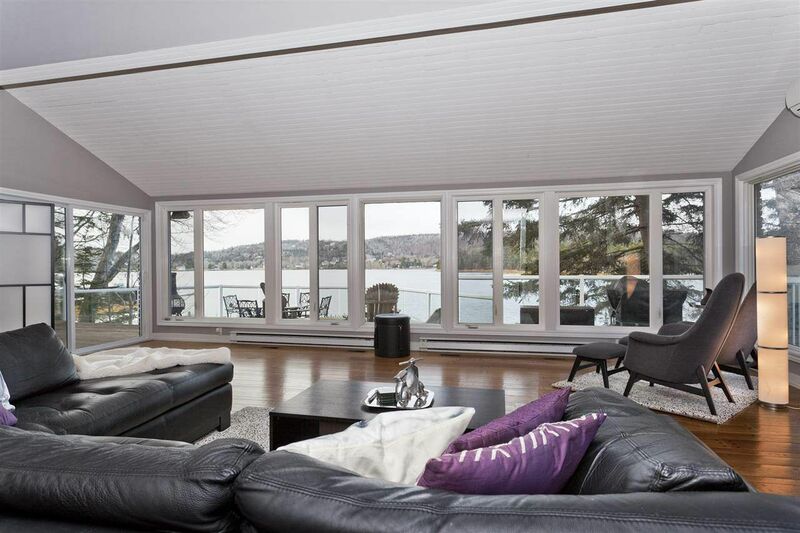 Built to maximize the use of the sloping property and the exceptional views of St. Margaret’s Bay. The 190 feet of ocean frontage includes extensive outside decking, wharf & floating dock. Renovated foyer with slate flooring welcomes you to this 4 bedroom home with impressive Bruce oak pegged hardwood flooring, abundant windows and vaulted ceilings. Renovated kitchen with island and suspended breakfast nook is a real charm. Dining area with fireplace overlooks the great room with views of ocean. Great Room opens to decks and provides a wall of views. Wake up to the call of the loons on the main floor master ensuite. Ensuite has jetted tub, shower, double sinks. Additional features include: centrally located den and office with fireplace; family room with pool table and walk out to hot tub; front patio for morning coffee; and 2 level double garage. This oceanfront home is less than 5 minutes from elementary school, walking/biking trails and cafe. Easy access to Halifax.